The complete work is also very beautiful. And oh, those basses! Funny story. When I was very little, I had a record called Sparky and the Magic Piano. Did you have this record? I still have it....very scratched and worn...in my collection. Sparky is a little boy struggling to learn how to play the piano. He has a dream that his piano comes to life and talks to him, and let's him play any piece he wants. He ends up going on tour and amazing the world. But like all dreams, it comes to an abrupt end when suddenly, his piano stops playing for him. He is stranded on stage with a combative piano and faces humiliation. Anyway....one of the pieces he plays is the Prelude in C-sharp minor by Rachmaninoff. 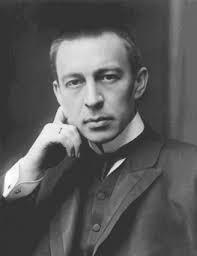 (funny side note....Rachmaninoff was known amongst his friends as "C-sharp" due to this composition's immense popularity.) When I heard Sparky announce he was going to play the Prelude in C-sharp minor by Rachmaninoff, I thought this was his first and last name....I had heard of Rock Hudson, and I assumed this was Rock Maninoff. I told my parents that Maninoff was my new favorite composer and they stared at me...."who?" "Maninoff....Rock Maninoff." The look of their faces was priceless and I endured a fair amount of good-natured ribbing for many years afterwards.